Recently we met a special Tripawd Greyhound named Bocce. 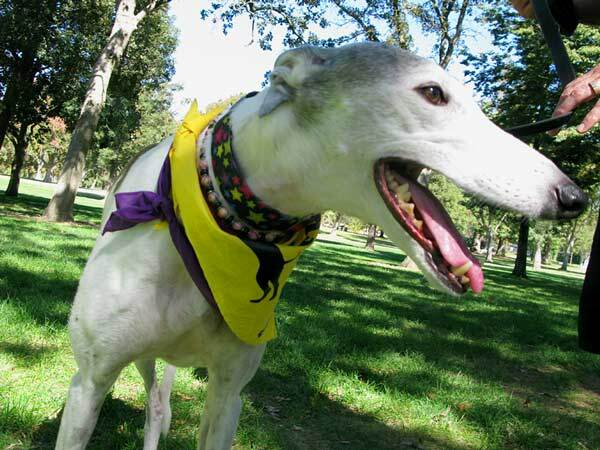 He wore a purple bandanna at the Morris Animal Foundation K9 Cancer Walk, to indicate he’s a cancer survivor. Looking at his hoppy face we never would’ve guessed that Bocce had a very rough amputation recovery and almost died from a post-operative bleeding disorder in Greyhounds. 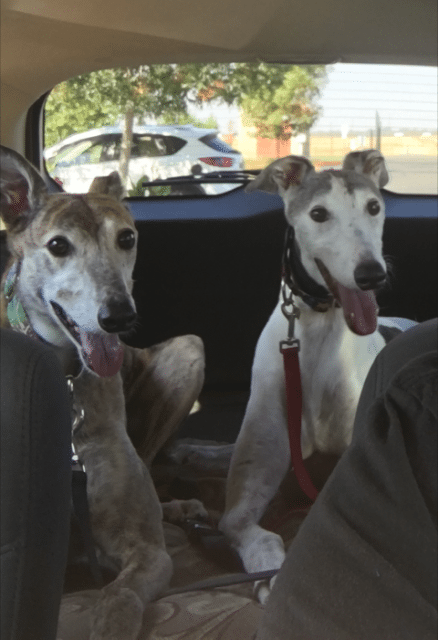 We asked his Momma Rosemarie to share his Tripawd Tuesday story not to scare future Tripawd parents, but to 1) give hope to others going through a ruff amputation recovery and 2) to raise awareness about the special medical needs of Greyhound dogs who undergo amputation surgery. Keep reading and prepare to be awed and inspired! Bocce Ball is a rescued, retired racing Greyhound, he is 6 years old. He raced at the Tuscon Greyhound Park in one of the highest racing divisions they had…his racing career lasted almost 2 years. He left the track with no injuries! We were lucky to bring him home and welcome him into our family, October 3rd, 2013. We could see right from the beginning he was such a love, really good with my other Grey, who is very alpha, and just the most wonderful, sweet, loving and affectionate Grey we could ever ask for! On March 4th, 2016, he ran into our kitchen from our back patio, something happened to his back left leg, we knew right away, he had broken it, it was a compound fracture, his bone was sticking out of his leg. We raced him to our vet, Mueller Pet Medical Center, open 24 hours, where we have been clients for over 30 years…..and just prayed he would be ok! We never thought about bone cancer at this point. After meeting with the doctor, they felt they could call in an orthopedic surgeon and fix his leg, but they wanted to be sure nothing else was going on. We were very worried at this point and were unsure what the outcome would be. We received a call later that night, it was osteosarcoma….bone cancer, a very common diagnosis in Greyhounds…and a very dreaded one. The leg would need to be amputated. We proceeded with that knowing his lungs were clear of cancer, and all bloodwork showed up clean. This was a very frightening, and quite scary decision…we had never been through anything like this with any of our dogs before. We questioned if we were doing the right thing. We reached out to our Greyhound groups, and they all encouraged us and said that three legged dogs do just fine! On March 5th he had his surgery. By March 7th…he was not doing well….very bruised and his legs were all swollen, we learned that a drug that is routinely given to Greys to help with clotting, was not given…it’s called aminocaproic acid. The doctors were left shaking their heads, and we were heartbroken, not only to see him trying to move about with his three legs, but to see him so bruised, he looked like a side of raw beef! It was awful. We questioned what we had done. We visited him two sometimes three times a day….one doctor, in particular, that I really credit with saving him, got that medicine on board quickly, and we prayed he would come back around. There were a few days when all the doctors thought he was not going to pull through. Because he was in the ICU unit for 2 weeks, he picked up infection after infection, the worse being an e-coli infection in his amputation incision, this required another surgery to actually remove four more inches of his femur bone, because the tissue around the bone had deteriorated. After three weeks in ICU he was ready to come home. We actually brought him home one night prior to that surgery, just so he could come home and be around us and our other Grey….the doctors thought this might lift his spirits! He made it thorough the second surgery and after about three weeks at Mueller, was ready to come home. He did develop bed sores on both of his elbows, since he had been laying around so much…even after follow up laser treatments to help heal these, one required yet another surgery. From the moment we finally brought him home, even though he went in at 76 pounds, and went down to 56, he was strong and continued to thrive. The staff at Mueller suggested we continue the laser treatments each day, for one month, we brought him in, they did them, and we took him home. Needless to say, he was quite popular with the staff….they said he was the best dog patient ever, with all they did to him, he never got angry, or tried to bite anyone! Now it was time for him to get even stronger….he did great on three legs, going up and down the two stairs in and out of our garage….moving around. It was as if he’d never had that fourth leg, we were amazed. He loved to go on his walks and run, just like before. He was on many, many meds….from medicine for nerve pain, to antibiotics….to anti – inflammatory drugs. He gained his weight back, and muscle mass…..the staff at Mueller was really happy with his progress….they recommended 6 months of follow up chemo, with Vista Veterinary. I am happy to say, his last treatment was today, and so far so good. He never had any problems with the chemo….and really continues to thrive. He is a very lucky dog….and we are very lucky to have him. My advice to anyone going through what we did….would be this, dogs really do adapt, they don’t go through the mental side of what I would assume a human would. The staff at Mueller was so kind and compassionate with him, and with us, it really helped us to know we had make the right decision. There is a week or so where the stability is not good…..but after that, they really do rebound. If we had not had all the other complications, although they provided a learning experience for us and the vet, the actual amputation would have really gone much more smoothly. What a story – Bocce’s recovery was hard won with that rough start. But what a champion he is. A warrior. Bravo, Bocce! Wishing you continued “Buona fortuna”, you handsome boy!! Rosemarie, I had no idea what you all were going through with Bocce. I wondered why you hadn’t been around. God Bless you and sweet Bocce. A very inspiration story! And I love the picture of the two dogs together. They look so happy.